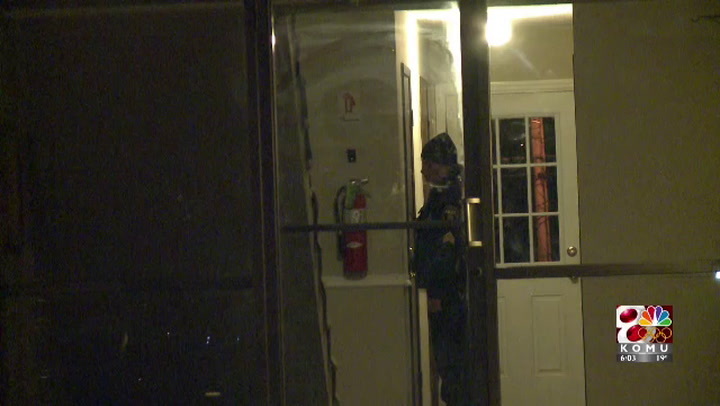 COLUMBIA - A suspect wanted for weapons violations refused to leave his apartment Friday night. The Columbia Police Department had a warrant for a suspect at 220 Apple Tree Court, however, officers were unable to make an arrest. "Subjects are refusing to come out, and we don't have enough at this point to make an entry into the residence," Officer Amy Bishop said. Bishop said the Street Crimes Unit had information that the suspect was in the building earlier Friday evening. A female neighbor said the suspect and his girlfriend started fighting at around 6 p.m., and the police arrived at around 9:20 p.m.
Police stood outside the suspect's door yelling for him to come out with his "hands up and empty." Two officers inside the building tried to arrest the suspect for about two hours, but he remained barricaded inside his apartment. "Based on the facts that we don't have enough to make an entry, we've exhausted our resources at this time," Bishop said. Police left Friday just after 11 p.m., but they said they still plan to make an arrest. "Folks inside the apartment complex know to call us if they see the subject that we believe to be inside, and at that time we'll come back," Bishop said. KOMU 8 News will continue to update this story.